RTH (Rettungstransporthubschrauber) Eurocopter EC-135 P2+ D-HDRU of DRF Luftrettung was seeen in service as "Christoph 46" at the helipad of the DRF-Luftrettungszentrum Zwickau in Thüringen, Germany, on 20 July 2013. Call sign "Christoph" is used for the German lifeliner helicopters since 1970 and is derived of Saint Christophorus, the Patron Saint for all travellers. The DRF facilities at "Städtische Klinikum Heinrich-Braun-Krankenhaus Zwickau", LRZ Zwickau, were opened on 1 August 1991. The helicopter in service was MBB BO.105CBS-5, like the BO.105CBS-5 D-HLLL. In July 2009, DRF Luftrettung replaced the MBB BO.105CBS-5 helicopter in service as "Christoph 46" by the Eurocopter EC135 P2+. The D-HDRU was the first Eurocopter EC135 P2+ in service as "Christoph 46". The 2009-built Eurocopter EC-135 P2+ c/n 0790 was testflown with Eurocopter Deutschland test registration D-HCBI. 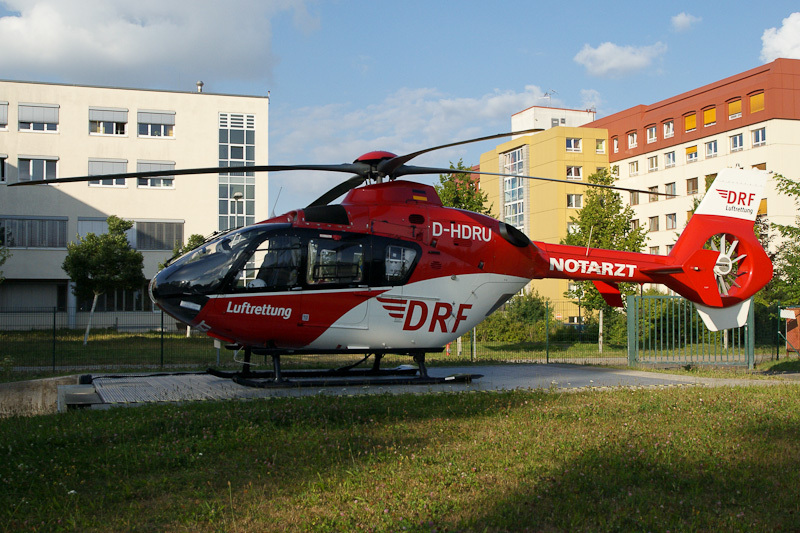 On 25 March 2009, the helicopter was registered D-HDRU with DRF - Deutsche Rettungsflugwacht e.V., Nürnberg Airport. Starting from 23 September 2008, the DRF-Deutsche Rettungsflugwacht e.V. introduced a new name and logo. From that day, the former DRF consists of three parts: a non-profit sponsored association, a foundation under public law and a non-profit corporation which is the operational unit. The operational work of the DRF continued as before. The German air rescue companies HSD-Hubschauber Sonder Dienst Flugbetriebs and HDM Luftrettung also appeared under the name of DRF Luftrettung. The previous branding of “Air Rescue Alliance TEAM DRF” is no longer used.